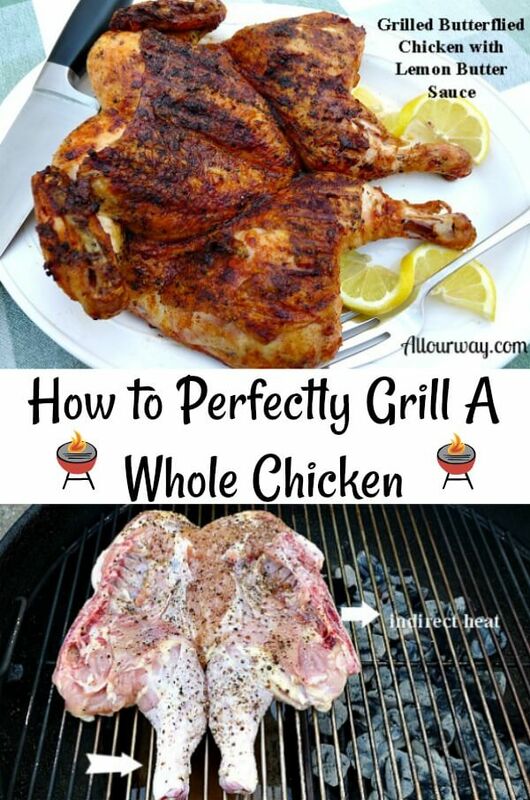 You’ve learned how to butterfly a chicken . . . . you’ve seasoned it with salt and pepper . . . . and now we’re ready to heat up the grill and make grilled butterflied chicken or grilled spatchcocked chicken. Spray a clean grill rack with non-stick vegetable spray and then set the rack aside. Prepare coals as we instructed in a previous post. 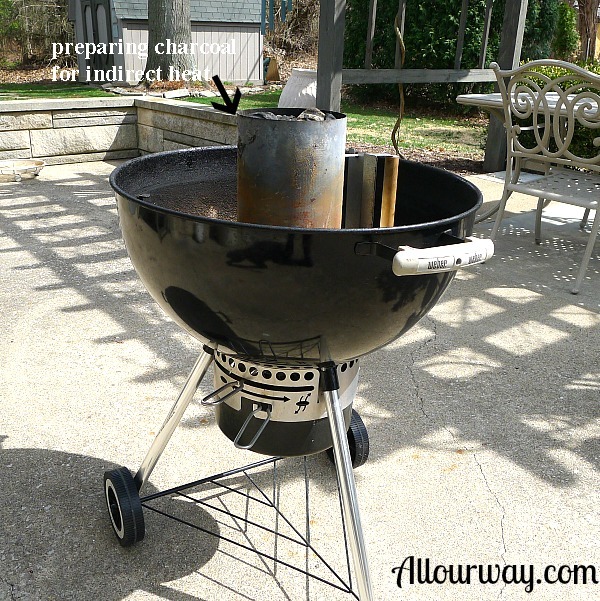 Preparing the charcoal for indirect heat. 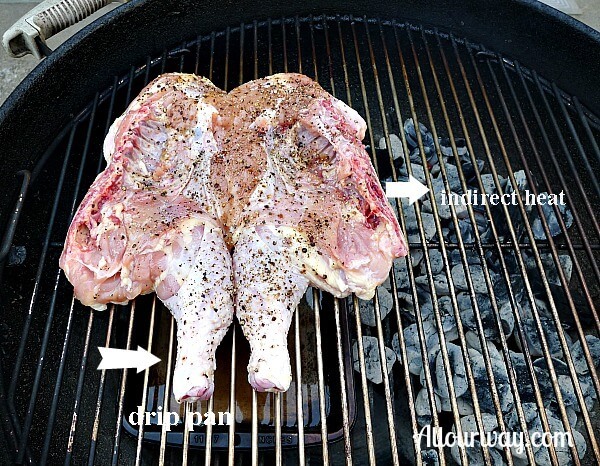 For this recipe, we will place a drip pan with water on one side of the grill and the coals on the other side for an indirect heating method. This is the best cooking method for a whole chicken because it’s not directly over the flames, but off to one side. Once the coals are an ash gray we spread them out and put the grate back on and then cover the grill. We wait until the inside temp of the grill reaches 350 F.
We are now ready to put the chicken on. To start off with you put the chicken skin side down over the drip pan. Squirt some of the lemon butter sauce on the bone side. . . .spread it out with a basting brush. . . . it will soak in. Check after 15 minutes to see how the skin is browning. . . . when it’s nicely browned turn it over. Squirt a little bit more of the lemon butter sauce on this side and baste with the brush. Continue to cook for 20 minutes more, then turn the chicken over and baste the bone side again. Then approximately every 10 minutes continue to squirt the lemon butter sauce and baste. You can baste as often as you like. Stop basting when the chicken is nearing 160F. Once the spatchcocked chicken reaches 165F it is ready to remove from the grill onto a platter and tent with aluminum foil. Resting is the key to a moist chicken. Once the bird is off the grill it needs time to rest, about 15 to 20 minutes, so that the juices have time to redistribute. We use this sauce on chicken wings and chicken pieces also. It lasts for a long time in the refrigerator. Note: We welcome and encourage sharing links to All Our Way© 2014, but please do not copy or paste recipes or content to any media or website without express written consent. Unauthorized use of content and photos is a violation of the copyright law. I love the flavors you have going on this chicken Marisa. Garlic, lemon, butter my kind of flavors. I have to try this one soon. Love how easy you make your recipes. I love the indirect heat tip! We actually grilled some chicken last week and lemme tell you, it became one toasty and fiery fiasco lol. 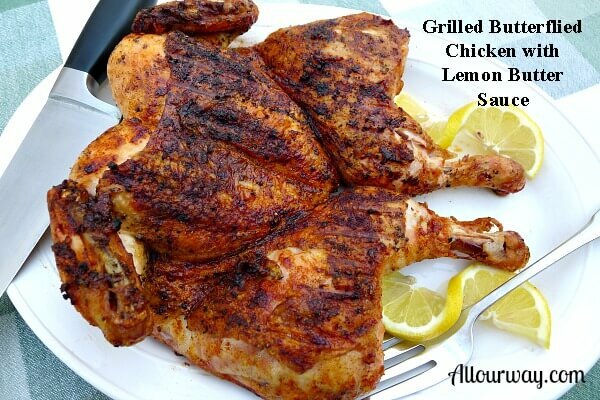 We’d love to try your recipe next and your grilling method. We got lots of grilling weather to look forward to! Thank you for signing on. We always welcome new subscribers. 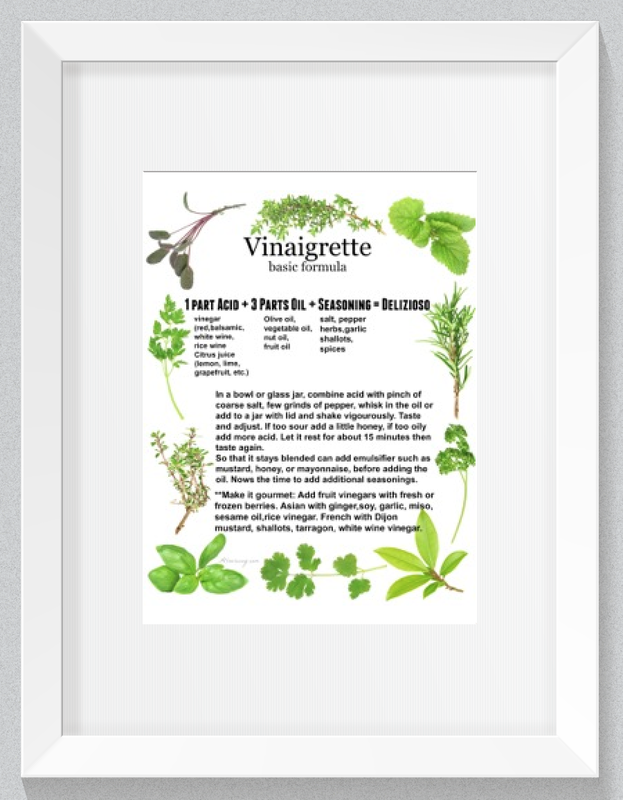 We hope you enjoy the many new recipes we’ll be posting.